Most entrepreneurs go into business with a desire for more freedom, not more discipline. However the path to success requires a disciplined approach in order to attain this ultimate goal of more freedom. As a Packer fan it was insightful to see the respect that the Green Bay Packer players have for Bill Belichick and the New England Patriots leading up to their game last Sunday. An article in the Milwaukee Journal Sentinel Packers respect, praise Belichick's 'disciplined' Patriots highlighted this same principle as the key to Belichick’s success. “A culture of discipline is not a principle of business; it is a principle of greatness.” And…. Jim Collins suggests these steps to attaining the Good to Great business model: Disciplined People, Disciplined Thought, and Disciplined Action. What does this look like? Would you like to test yourself and your company as to whether you’re meeting this criterion? One easy way to discover this is to download the Rockefeller Habits Checklist. Grade you and your team’s performance based on the checklist. Verne Harnish’s new book, Scaling Up is another good model to follow. The Rockefeller Habits Checklist provides a list of ten execution disciplines that follow the Good to Great business principles Collins advocated in his book. In Good to Great Jim Collins indicates building a business from good to great requires “First Who Then What!” He notes that achieving success requires the “Right People Doing the Right Things Right.” This is exactly why Verne makes People the first of the Four Decisions to work on in Scaling Up. Right People: No matter the industry, product or service, the most important decision you make is first selecting your people. This requires you to have a method or system for acquiring the right people. As Gazelles coaches we recommend to our coaching clients Topgrading. Topgrading requires a high degree of discipline to carry out. To meet the 90% hiring of “A” players you need to follow the guidelines consistently and be patient with the process. Not every business is willing to do this. A three and a half hour interview with the top three candidates, the development of a Job Summary Scorecard are all pieces that some businesses are unwilling to follow. Hiring Greatness, it turns out, is largely a matter of conscious choice, and discipline.” Most businesses are resistant to follow this type of discipline. Eventually they face the consequences in the results they attain in the hiring process. Doing the Right Things: This discipline is choosing the correct priorities. This is a critical element in the three Disciplines and Strategic Discipline. Each quarter, and annually the business should determine what the top 3-5 priorities are and what the One Thing is for each quarter and year. Again many businesses fail to do this type of planning. Furthermore if they do they often don’t decide on the One Thing focus. Nor do they develop the required dashboards (metrics) and meeting rhythms (Cadence of Accountability) to ensure everyone is focused on the Right Things. Greatness evades these businesses. Things Right: This is the fourth element of Strategic Discipline. Determining your Work Process Flowcharts elevates your focus to the systems that provide your competitive edge. These proprietary systems need to function consistently at a high level for you to maintain your superiority. Dashboards or Key Strategic Indicators (KPI’s) should be in place to consistently measure performance. The same should be the case with what your people are focused on. Each position should have a set of leading and lagging indicators which define the expectations and measurements they are required to achieve. Doing things right is a disciplined approach to operating your business. Aubrey Daniels notes that a company is always perfectly designed to produce what it is producing. The behaviors associated with undesirable outcomes are being reinforced. It requires discipline to identify, monitor, modify or create new reinforcers and systems to produce desirable outcomes. This is not new stuff. It’s exactly what Jim Collins emphasizes in every book he’s done researching great companies and those companies that fail. A business coach is not immune to discipline. A good coaching relationship requires accountability and asking the right questions. 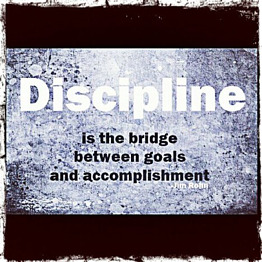 Do you have the necessary discipline in your business? Do you have the right people and are they doing the right things right? As discussed in Social Capital – Keith Ferrazzi Las Vegas Growth Summit relationships are a key to business and personal success. This past week I had the opportunity to review my notes from Brian Tracy’s Psychology of Achievement on Superior Human Relations. It reminded me of how challenging relationships can be especially for leaders and managers. It also reinforced many of the principles Aubrey Daniels describes in his book Bringing Out the Best in People. I’ll explore some of these Superior Human Relations principles next blog.